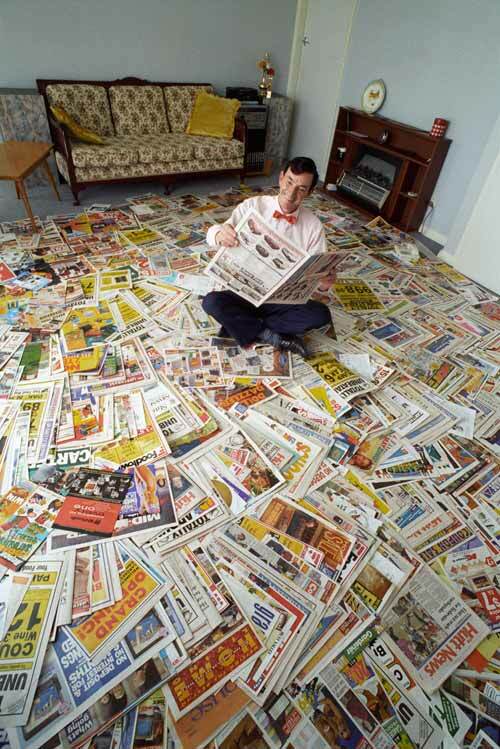 Jimmy McGuinness sits amid the estimated 1,500 pieces of junk mail that had been delivered to his home in 1995. During the 1980s and 1990s there was an increase in both addressed and unaddressed advertising material arriving in the letterbox. The Privacy Act 1993 made it more difficult to send addressed mail, since organisations were forbidden to give out addresses for purposes for which they had not obtained permission. There was also a growing hostility to junk mail, and many people put notices on their mailbox requesting ‘No junk mail’. Jimmy McGuinness was an ardent junk-mail hater and collected the material over one year to make the point about the quantity of unsolicited advertising. Since 1995 the percentage of advertising spend on both addressed and unaddressed mail has fallen.